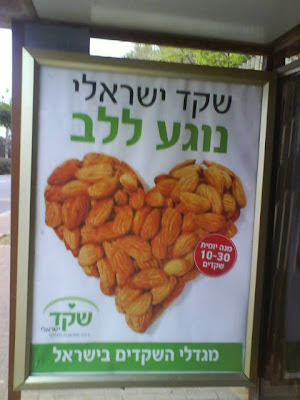 This advertisments for Israeli almonds seems to be everywhere. Should you miss it once, a few meters away you will have the opportunity to see it again. This morning I had my first rejection for a heart. I asked someone to photograph a heart they were wearing and I was turned down. Then, as though she knew I needed a pick me up, my wonderful friend Danielle surprised me with this picture she took this morning - Thank you! This heart proves that opportunities, like this ad, are everywhere and we cannot let rejections keep us down!